AncestorPuzzles.com: 61 Bullets- The Death of Huey P. Long: Assassination or Friendly Fire? 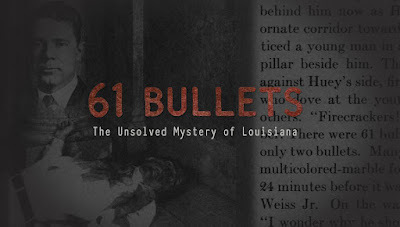 61 Bullets- The Death of Huey P. Long: Assassination or Friendly Fire? One of the most tragic events in Louisiana history occurred here. On September 8, 1935, U.S. Sen. Huey P. Long was shot in the hall beside what is now the Speaker's Office. He died two days later as a result of his wounds. We are spending a week in Louisiana in celebration of our July birthdays, my wife, Robin's 60th birthday and my 61st. 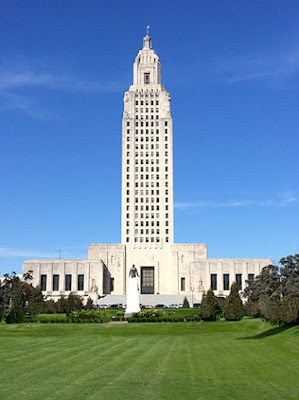 We were in Baton Rouge yesterday and toured the Louisiana State Capitol. We enjoy visiting state capitols having lived so many years in Sacramento and having so many family connections with state government. The Louisiana State Capitol is the tallest in all of the 50 states. I was intrigued by the observation deck on the 27th floor as there are not many opportunities to get a bird's eye view of the terrain on the Gulf Coast of Texas and Louisiana. As we entered the Capitol there was a docent who encouraged us to look inside the House and the Senate chambers and to view the relics of the death of U.S. Senator Huey P. Long. 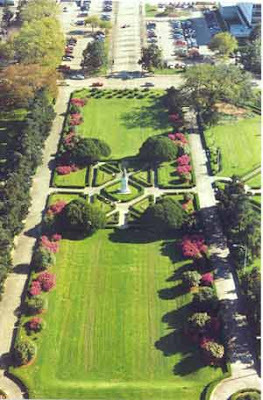 We hurried to the observation deck to enjoy the view of Baton Rouge and were intrigued to learn that Senator Long had been buried on the south lawn and that a statue of him had been erected over his grave. View from the south side of the Observation Deck showing the statue of Huey Long in the center of the lawn. We continued our travels to New Orleans Saturday afternoon and have been enjoying the sights, sounds and tastes of this wonderful city. We were headed to our hotel when a poster about an exhibit on slavery caught my eye. 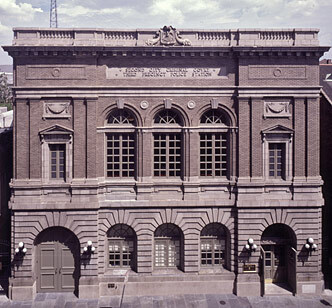 We looked into the window of the Williams Research Collection at 410 Chartres St. and the staff opened the door and invited us to attend a free screening of a documentary about the death of Huey P. Long. We looked at each other and smiled at our good fortune and were ushered into the documentary in progress. September 8, 1935. Bullets ricochet through the marble corridors of the Louisiana State Capitol in Baton Rouge. When the shooting finally stops and the panicked screaming subsides, two men have been fatally wounded. The first: populist United States Senator Huey P. Long, the most powerful man in Louisiana, and one of the most prominent political figures in 1930s America. The second: Dr. Carl Weiss, a respected local physician, and Long's presumed assailant. 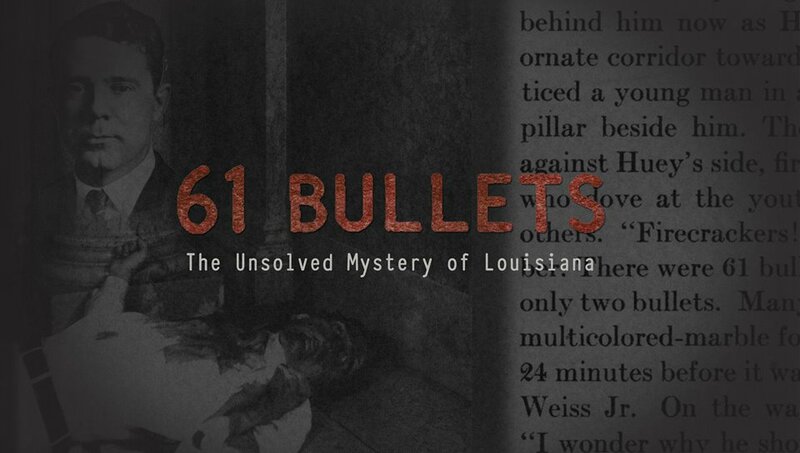 Weiss is riddled with sixty bullets, some of which have passed through his body and lodged in the alabaster walls. Blood soaks through his white linen suit and onto the ornate floor of the State Capitol. 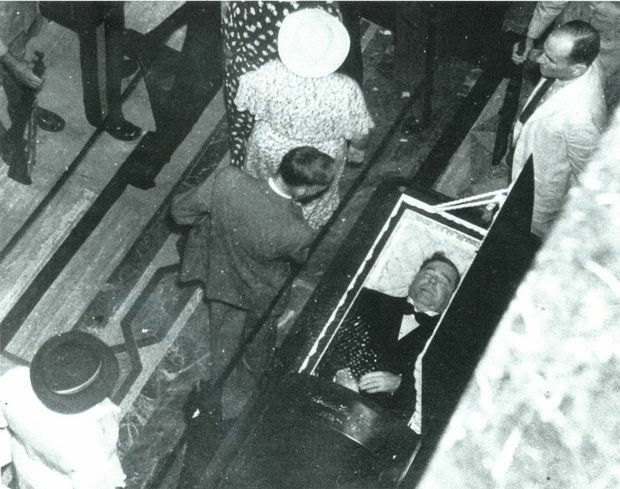 Huey Long, known as "The Kingfish," is rushed to the hospital, but pronounced dead thirty hours later. Louisiana politics - and the lives of the two men's families - will never be the same. Through the debate over how Huey Long was killed, 61 Bullets explores a piece of history that is as contentious as the man himself. We watch two families grasp for closure in the wake of a tragedy with ongoing political and personal ramifications. We engage those who know the most (Long experts) and those who care the most (the families of Long and Weiss) in a juxtaposition of competing narratives of the biggest political killing between McKinley and Kennedy. As the Weisses seek to rewrite history and clear their family name, the Longs strive to defend the legacy of their patriarch and preserve his iconic status. The screening was followed by a panel discussion including one of the filmmakers and two experts. The discussion made it clear that this documentary does an excellent job of navigating a very difficult terrain of two families caught in a series of very tragic events. History is left with an enduring mystery made more poignant from the family stories that are told through dozens of interviews. Experts examine every angle of the limited evidence. In the end we are left with another "Ancestor Puzzle." For an additional touch of irony and coincidence we walked across the street and enjoyed an excellent meal at Kingfish Restaurant. We watched as one of the panelists entered the restaurant and had her picture taken in front of the mural size picture of the "Kingfish", Huey P. Long.